Learn about Carpal Tunnel Test from Malaysia’s top Non-Surgical Teams that Treat Wrist Pain. Why you Need a Carpal Tunnel Test? Carpal Tunnel Test is a critical step in getting rid of the pain and symptoms of carpal tunnel. An Accurate carpal tunnel test is essential to the diagnosis of carpal tunnel syndrome. Additionally, proper evaluation, assessments, and diagnostics tests are needed to ensure a diagnosis-based treatment that targets the root-cause of carpal tunnel syndrome. In this section, we will go over the procedures and methods used in the carpal tunnel test. Also, we will provide you with the simple assessment you can do at home. Why does the wrist and finger hurt or become numb? The classic symptoms of CTS or Carpal Tunnel Syndrome include numbness, tingling, pain, burning sensation or weakness in the wrist and hand. Pins and needles sensations are common. The pins and needles sensations (numbness and burning sensations) can occur simultaneously with pain in the affected thumb, index finger, middle finger and half of the fourth finger. Pain and pins and needles sensations are the results of repetitive injuries that increase the pressure on the sensitive nerves at the wrist. In severe cases, symptoms of a carpal tunnel syndrome (CTS) can radiate or shot into the wrist and lower forearm. At times, symptoms may be relieved temporarily by shaking the hand. Conditions such as diabetes, rheumatoid arthritis, and pregnancy are more likely to cause carpal tunnel syndrome or carpal tunnel like symptoms. Carpal tunnel syndrome is just as common as is back pain during pregnancy in expecting mothers. Simply put, carpal tunnel syndrome is a condition that leads to the irritation of the nerves that control the function of your wrist, hand, and fingers. Before the nerve enters the hand, it must pass through a canal or channel called the carpal canal or carpal tunnel. In basic terms, this canal is a passageway on the palmar aspect of your wrist. The boundaries of the carpal canal are the tiny bones of the wrist and a tendinous sheet on top called the flexor retinaculum. The flexor retinaculum (better known as the anterior annual ligament or the transverse carpal ligament) arches over the wrist bones. The importance of this canal can never be overstated. The carpal canal is not just a passageway but also housing and a means of anchoring for the tendons that enable hand, wrist, and finger movements. Nine tendons, including the flexor digitorum profundus, vessels (artery and vein), and a nerve (median nerve) are housed within the carpal canal (carpal tunnel). Repetitive hand movements, trauma, or prolonged wrist extension can irritate the flexor retinaculum as well as one or more of the tendons that pass through the carpal tunnel. An irritated flexor retinaculum or chronic tendonitis of the wrist can lead to thickening of the tendons or the flexor retinaculum. Hypertrophy refers to a thickened flexor retinaculum or tendons. Hypertrophy of the flexor retinaculum or one of the nine tendons is the leading cause of pain, numbness, or burning sensations in the wrists or fingers. The carpal tunnel diagnostic tests are incomplete without a proper assessment of your flexor retinaculum. If you suffer from the symptoms mentioned above, the need for proper assessments is critical to your recovery. We will go through some basic carpal tunnel test to assess the vulnerability of the flexor retinaculum as related to the carpal tunnel in the coming sections of this page. What Is the Best Wrist Pain Exam You Can Do at Home? Do keep in mind that these tests and maneuvers, which are discussed below, are not meant to help you self-diagnosis a health condition. Tapping the palmar side of your wrist where the median nerve lies to reproduce the symptoms of carpal tunnel is called a Tinel sign or test. This test is meant to increase the pressure within the canal of Guyon. If issues exist, pain or pins and needles sensations are produced. A positive test with Tinel sign or Tinel’s test is when there is an increase in numbness, tingling sensation, electrical shock or pain in the fingers or the hand. 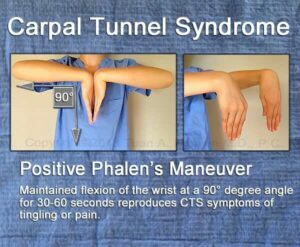 The Phalen’s test is an excellent method for evaluating carpal tunnel syndrome. Flexing or bending the wrist to about 90 degrees and holding the position for one minute comprises the Phalen’s test. This maneuver reduces the size of the carpal tunnel or canal, causing a compressive force that on the median nerve at the wrist. A positive Phalen’s test is present if there is a reproduction of the pins and needles or wrist pain. The Reverse Phalen’s test is another great indicator used as a carpal tunnel test. The reverse Phalen’s test involves the extension of the wrist to about 90 degrees. This position should be maintained for one minute. Carpal tunnel syndrome or CTS can be suspected if symptoms such as pain, numbness, tingling or burning sensation (pins and needles) in the hands or fingers are reproduced. Stretching of the median nerve in healthy individuals is asymptomatic (not painful), but it often irritates a hyper-sensitive median nerve. The pinch test can also be done as a carpal tunnel test at home. Pinching and holding an object with the thumb and index finger may show some weakness. In other words, if you have difficulty pinching and holding the object, it is considered a positive test. In other words, you may have carpal tunnel syndrome. What are the best clinical Diagnostic Tests that identifies the Actual Cause of Your Wrist or Hand Symptoms? 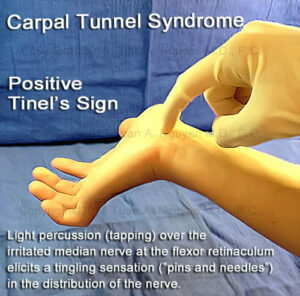 Carpal tunnel syndrome is a condition resulting from the irritation or malfunction of the median nerve. The best clinical means of assessing the function of the median nerve is a nerve test. The nerve conduction study or tests are assessments performed for carpal tunnel patients by a neurologist. Keep in mind that neurologists are not surgeons but specialists who specialize in assessments, diagnostic tests, and treatments for nerve disorders. However, often, a neurologist refers patients for surgery. Carpal tunnel surgery, in our opinion, is one treatment that has failed too often and, as such, should be avoided. But before we talk about the treatment of carpal tunnel syndrome, let’s review the basics of the nerve condition test or other diagnostic tests that a neurologist performs on suspected carpal tunnel patients. 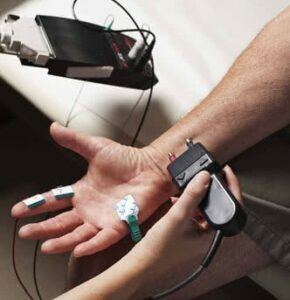 Nerve conduction tests are variations of electromyography, where two or more self-adhesive electrodes are used to assess the health of the median nerve. The examiner then uses an electrode to pass a few electrical impulses to study the conductivity of the median nerve. If your median nerve is irritated or damaged, the speed through which the current passes will be slower and, as such, a confirmation of your carpal tunnel syndrome (CTS) diagnosis. Can You Get CTS Like Symptoms From a Slipped Disc? Aside from wrist issues, the neck is the most common source of the pins and needles sensations most feel in the wrist, hand, and fingers. So, the answer is YES; a Slip-Disc in the neck can cause carpal-tunnel-like pain and symptoms. 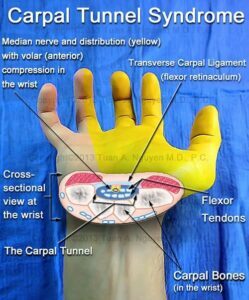 As mentioned earlier, the median nerve is the implicated in carpal tunnel issues. The Median nerve is part of the brachial plexus. The brachial plexus is a collection or network of nerves that originate from C5, C6, C7 and T1 spinal segments. Spinal disc issues such as a slipped disc, or bony malpositioning of spinal bones (subluxations) can pinch nerve roots that form the median nerve or brachial plexus. A pinched nerve in the neck often results in neck pain, upper back pain and pain in the arms, wrists, hands, and finger. Also, pins and needle-like sensations are exceedingly common in slipped disc conditions. Therefore, diagnosis of carpal tunnel syndrome should be made when other structures such as the shoulders and elbows are ruled out as causes. What are other structures assessed in a CTS Examinations? Diagnosis of carpal tunnel is incomplete without the proper evaluations of the elbow, shoulder, and, of course, the neck. An impingement syndrome at any of these sites can lead to or mimic a carpal tunnel-like syndrome. It is not uncommon to have neck pain or upper back problem coupled with carpal tunnel syndrome. Therefore, the neck, shoulder, or cervical has to be checked to look for nerve impingements at other sites. All the abnormalities have to be treated simultaneously to achieve the best clinical result. A slip-disc in the neck can compress nerve roots that control the wrist. Why would your Shoulder, Arms, and Elbows Needs Thorough Assemsnts if You have Pins and Needles? Shoulder, arm and elbow conditions such as bursitis and tendonitis can also cause the pins and needles like sensations. Repetitive inures to the elbow as seen with golfer’s elbow or tennis elbow can increase the pressure on the median nerve. We mentioned earlier that the median nerve was part of the brachial plexus. What we forgot to mentions is that this nerve can get trapped in the neck, shoulders, elbows or forearm as it makes its way to the wrist. Compression of the median nerve at any of the mentioned sites leads to pins and needles and pain in wrists; mimicking or causing carpal tunnel-like pain and symptoms. In short, if you suffer from pins and needles or carpal tunnel, visit our non-surgical experts. Our clinical teams of chiropractors and physical therapists or physiotherapists have the skills, knowledge, and technology to treat and diagnose carpal tunnel with ease. We offer non-surgical treatments and methods that others do not. As such, our clinical successes are higher than others. What Should You do with a Diagnosissis of a CTS? Well, don’t opt for carpal tunnel surgery. It fails too often. It causes more scar tissues, and as mentioned, scar tissue is the cause of the carpal tunnel. Non-surgical conservative treatment of the wrist or other structures (if needed) is your best options. Physical therapy (physiotherapy) offers hope, but the impact of care you get from physical therapy is enhanced if combined with clinical chiropractic. And, that is exactly what we offer. Our integrative conservative treatment is better suited for the short and long term. Best of all, the technologies we use in our center can certainly impact the rate of your recovery. The most efficient physiotherapy or physical therapy device for carpal tunnel syndrome of CTS is shockwave therapy. Our Kuala Lumpur chiropractic center, we utilize this device for faster recovery. Also, wrist splints and Cryotherapy (icing) can help minimize the inflammatory processes within the wrist. Our clinical teams will provide you with the perfect wrist splints and provide comprehensive home care instructions. Wrist splints and home care (Ice and exercise) are critical to decreasing the inflammatory processes in the wrists. Wrist exercise and exercises specifically for the carpal tunnel are great, but they must be focused and targeted. The clinical staff of Chiropractic Specialty Centers® consists of non-surgical experts when it comes to a carpal tunnel syndrome test and treatment. Visit one of our centers today for an accurate diagnosis through a proven clinical carpal tunnel test today.